Even as some water agencies in Northern California relax water conservation mandates for their customers after a wet winter, the state is still facing a water crisis. Infrastructure and water supplies are severely threatened, for which state lawmakers approved an $11 billion water bond to go before voters in November. Orange County residents, and businesses and community leaders are invited to engage with water utilities and legislators on possible remedies, long-term solutions and the pros and cons of the water bond at the 3rd Annual O.C. Water Summit, 7:30 a.m. to 1:30 p.m., May 14 at the Grand Californian Hotel at Disneyland Resort (Anaheim). 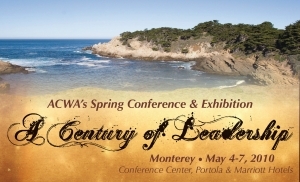 Key water issues and the role that public water agencies have played in shaping California’s history will be the focus of the Association of California Water Agencies’ (ACWA) 2010 Spring Conference & Exhibition in Monterey May 4-7. More than 1,700 local water leaders are expected to attend the event, which marks the statewide association’s centennial anniversary.